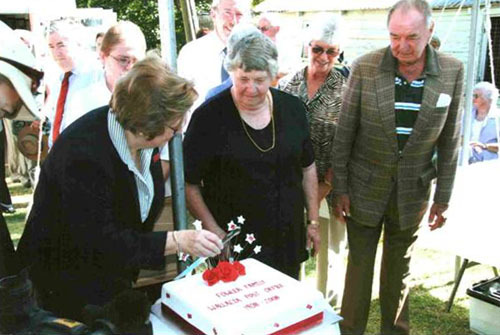 Elaine Crossman, nee Bentley, and Reg Blattman being handed the knife with which to cut the Centenary cake by current postmaster, Margaret Fowler. Wartime local teenagers from Silverdale and Mulgoa, they were appointed by John Fowler to assist Marjorie Fowler as manager of the Wallacia Post Office when her husband, Bernard, joined the army in 1940 along with elder brother, Keith, and their former local school and golf playing friends. Photos courtesy of Margaret Fowler. 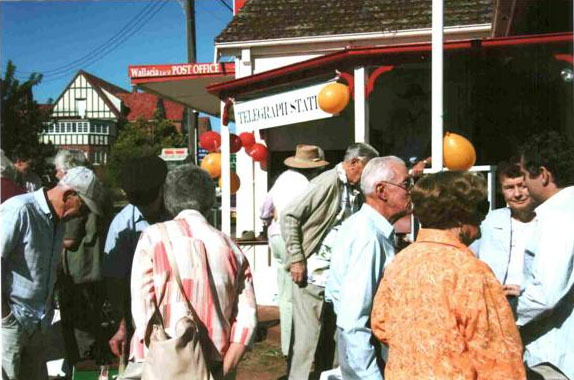 (Middleground) Morsecodians Celebratory Telegraph Station on the Wallacia Post Office verandah. Souvenir Telegrams were sent from here to a Receiving Station at Beechworth, Victoria, and posted. (Foreground) Roger Bale and Matthew Fowler, Kangaroo Island, in a group of four, reminiscing about past Wallacia glories. Roger with elder brother, Harold, sold Bales Buses to Bosnjaks. It was founded in Wallacia by their late father, 'Billy' Bale, in the 1920's and was situated on the opposite Park Road corner to Fowler Bros Riding School, store and post office. Their distinctive dark red and dark cream colours were carried until recently. (Background) Hotel Wallacia against the skyline, built on portion of John Fowler's former sorghum paddock by Keith Fowler with Toohey's Brewery Ltd in 1936. Modelled on the Banff Hotel tourist experience, it was envisaged that it would become 'The 19th hole' for his Wallacia Golf Links and Club. The Penrith Press published a report on the 4th April 2008 of Wallacia Post Office's John Fowler Centenary Celebration as postmaster. 'Jack' is a third generation Joseph Holt descendant.